Can you believe we’re already 1/2 way through the week! With the new semester beginning and the work load piling up, I tend to lose track of time. Regardless, it’s time for another blog post 🙂 Although I’m busy with school, I’m finding that updating my blog is a way to reflect and relax. After getting home from an 8 hour day at school last night, I was exhausted and somewhat feeling nauseous. I had intentions of roasting up some veggies and making chicken, but the thought of it made my stomach churn a bit. 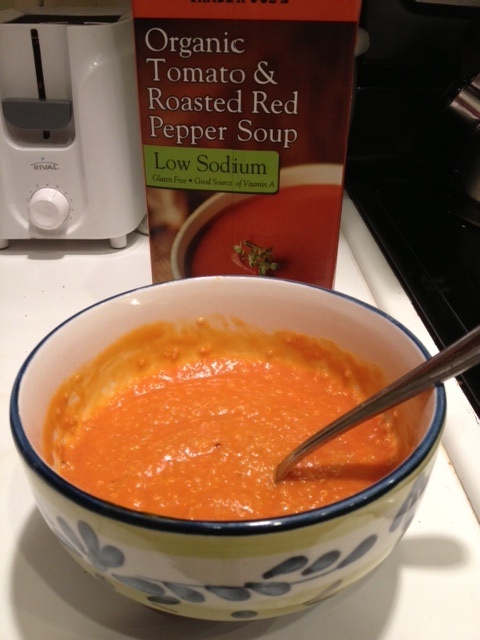 Instead, I listened to what my body wanted and turned to the ever so delicious and comforting tomato soup! As a child, my mother would make Campbell’s Tomato Soup with grilled cheese for a comfort meal. As an adult, when I crave that comfort, I turn to Trader Joe’s for their amazing Organic Tomato and Roasted Red Pepper Soup! During my latest TJ’s haul this past weekend, I ended up grabbing the low sodium version without realizing it. The taste was great but my favorite is the regular version. I ended up mixing the soup with 1/4 cup of quinoa to add in some protein. I found this was a great way to make the meal heartier! This soup is so creamy and full of flavor. It’s perfect for when you’re craving that bit of comfort! Not pictured is a side of mashed avocado on top of a slice of Ezekial Bread. PERFECTION! This morning I had the pleasure of sleeping in a tad bit extra! The only school commitment I had started at 1 and ended at 3:30, so I woke up at 8:30 and enjoyed the morning. 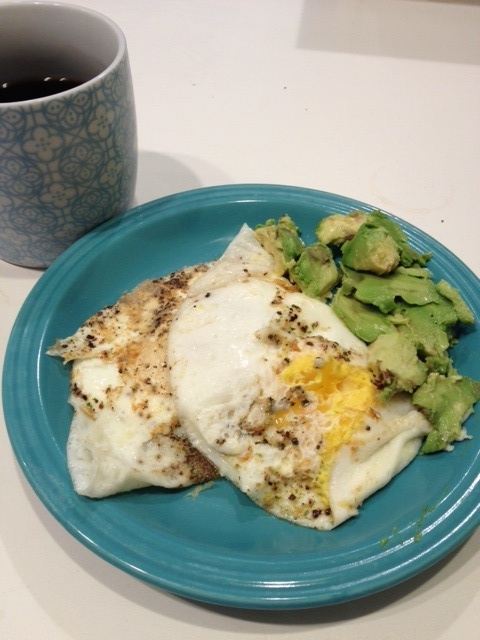 I made my way to the kitchen to make 2 eggs over easy and a side of avocado + black coffee. My go-to breakfast in the past week has been eggs. I get a certain food-kicks, but hey what’s wrong with that! Eggs are great sources of protein and full of omega 3’s. And yep, I’m not afraid to eat the yoke! A whole egg won’t kill ya my friends! Sometimes I’ll combine 2 egg whites and 1 whole egg for a yummy wholesome breakfast. Do what works for you! The next part of my morning was not the most pleasant…but it was necessary in my eyes. 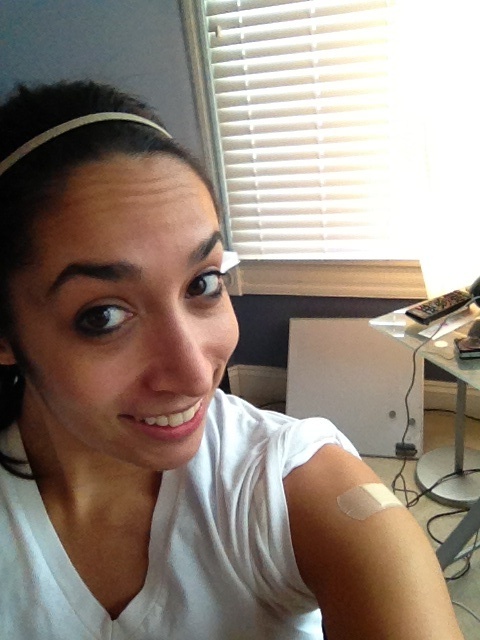 Since national news have been reporting that Flu Epidemic is at an all time high this year, I knew it was time that I face my fear of needles and get vaccinated. Since I have asthma, I’m at a greater risk for the flu. I not only wanted to protect myself, but also the little kiddos I’ll be working with this semester! In the morning, after breakfast I completed Tone it Up’s new toning routine “Love Your Total Body” and their “MalibootyA” workout. They are both toning routines and leave you feeling tight and toned! In the afternoon, I made a trip to the gym for some light cardio. My left ankle has been feeling a bit off in the past couple days so I decided to lay off the treadmill and hop on the elliptical, bike, and row machine. It was a bit on the lighter side, but I knew it was what my body needed! Sometimes I think it’s best to be attentive to your body’s needs. I knew my ankle needed a break, so a break it was given! Well, that’s it for me folks! I’m currently nomming on one of my favorite dinners: Spaghetti Squash! I want to post a quick and easy recipe soon on how I prepare it! Seriously so good!